Łutselkʼe[pronunciation?] 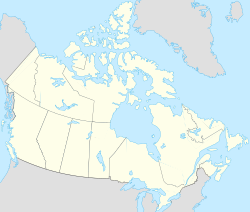 ("place of the Łutsel", the cisco, a type of small fish), also spelt Łutsel Kʼe, is a "designated authority" in the North Slave Region of the Northwest Territories, Canada. The community is located on the south shore near the eastern end of Great Slave Lake and until 1 July 1992, it was known as Snowdrift, as the community lies near the mouth of the Snowdrift River. Łutselkʼe is a First Nations community and the area was traditionally occupied by the Chipewyan Dene In 1925 the Hudson's Bay Company opened a post followed by the Roman Catholic Church. A school opened in 1960. There is a proposal ongoing for Thaidene Nene National Park Reserve, with an area of 14,000 km2 (5,400 sq mi), which has the support of the community. Population is 303 according to the 2016 Census a decrease of 2.7% over the 2011 Census. In the 2016 Census the majority of the population, 270 people, were First Nations, 10 people were Métis and 10 were Inuit. The main languages in the community are Denesuline and English. In 2017 the Government of the Northwest Territories reported that the population was 330 with an average yearly growth rate of 0.0% from 2007. In 2016, 115 people said they spoke an Indigenous languages as their mother tongue. Of these 105 spoke Dene (Chipewyan or Denesuline), 5 spoke Dogrib or Tłı̨chǫ and 5 spoke North Slavey or Hare. Another 5 people gave a Chinese language as their mother tongue. A total of 295 knew English and another 5 knew both English and French. There is a two-person Royal Canadian Mounted Police detachment and health centre with two nurses in the community. There is a single grocery store, the Lutselk'e Co-op, a post office and nine lodges or outfitters in the area. Education in the community is provided by the Lutsel K'e Dene School, which offers a comprehensive K-12 program. Additionally, there is also a community learning centre run by Aurora College. Although not accessible by road there is an airport, Lutselk'e Airport, with scheduled services from Yellowknife and an annual sealift is provided by Northern Transportation Company Limited from Hay River in the summer. Lutselk'e Water Aerodrome is available in the summer months when the lake is clear of ice. Łutsel Kʼe is represented by the Lutsel K'e Dene First Nation and are part of the Akaitcho Territory Government. ^ "NWT Communities - Łutselk'e". Government of the Northwest Territories: Department of Municipal and Community Affairs. Retrieved 2018-09-08. ^ "Snowdrift River". Geographical Names Data Base. Natural Resources Canada. Retrieved 2010-08-22. "Snowdrift River". Geographical Names Data Base. Natural Resources Canada. Retrieved 2010-08-22. Barnes, F.Q. Snowdrift Map-Area, District of Mackenzie, Northwest Territories (Preliminary Report). Geological Survey of Canada paper, 51-6. Ottawa, Ont: GSC, 1951. Bielawski, E. The Desecration of Nánúlá Kúé Impact of Taltson Hydroelectric Development on Dene Sonline. [s.l. ]: Łutsel Kʼe Dene First Nation, 1993. Canada, and M. M. Dillom Limited. Final Report Environmental Assessment Studies, Northern Canada Power Commission Facilities at Snowdrift, Repulse Bay and Grise Fiord, Northwest Territories. Edmonton, Alta: Environment Canada, 1978. Chambers, Cynthia Maude. Damaged and Needing Help Violence and Abuse in Aboriginal Families in Yellowknife and Lutsel K'e. [S.l. ]: Lutra Associates, 1993. Northwest Territories, and BHP Billiton Diamonds Inc. Communities and Diamonds Socio-Economic Impacts in the Communities of: Behchoko, Gameti, Whati, Wekweeti, Detah, Ndilo, Lutsel K'e, and Yellowknife : 2005 Annual Report of the Government of the Northwest Territories Under the BHP Billiton, Diavik and De Beers Socio-Economic Agreements. [Yellowknife]: Govt. of the Northwest Territories, 2006. Parlee, Brenda, Evelyn Marlowe, Lutsel K'e Dene First Nation. Traditional Knowledge on Community Health Community-Based Monitoring. Yellowknife: West Kitikmeot/Slave Study Society, 1998. Shinpo, Mitsuru, and Cyntha Struthers. A Preliminary Report Prepared for the Snowdrift Indian Band. Waterloo, Ont: St. Jerome's College, University of Waterloo, 1990. Weitzner, Viviane. Dealing Full Force Lutsel K'e Dene First Nation's Experience Negotiating with Mining Companies. Ottawa, Ont: North-South Institute, 2006. Wikimedia Commons has media related to Lutselk'e. This page was last edited on 12 March 2019, at 06:39 (UTC).